As the story of the horrific January 24 bombing at Moscow’s Domodedovo Airport continues to unfold, the parallels with past major terrorist attacks in Russia are striking. It is not just the high number of casualties (36 dead and 160 wounded) and that the perpetrators appear to have come from the volatile North Caucasus. As with earlier such violence, there were also serious warning signs in advance that were ignored, and the immediate handling of the attack by the authorities was botched. Above all, the confusing and contradictory response of both the security agencies and Russia’s leadership has once again raised troubling questions about the Kremlin’s counter-terrorism policies. Journalist, lawyer, human rights activist and businessman Maksharip Aushev, heir apparent to Ingushetia.org publisher Magomed Yevloyev (murdered in August 2008 becuase of his opposition activities),was brutally assassinated in Nazran, Ingushetia, on Sunday. Just as Natalia Estemirova, heir of Anna Politikovskaya, was liquidated, so too has become the fate of the heir of the firey Yevloyev, whose website boldly challenged the Kremlin’s mismanagement, manipulation, persecution and destruction of the Caucasus region. Aushev took over and ran Ingushetia.org after Yevloyev’s murder (which the Kremlin ridiculously tried to pass off as an “accident”). When Yevloyev was murdered, the Kremlin placed a military intelligence officer — i.e., a KGB spy — in charge of Ingushetia, and this killing is the inevitable result of the Kremlin’s further tragically impotent efforts to clamp down on dissent in the region. Aushev had been ritualistically persecuted by the Kremlin from the moment of Yevloyev’s killing (indeed, since well before it) in an obvious effort to intimdiate him into silence. Just last month he was the victim of a kidnapping attempt. So once again we see that the only way the crude thugs who operate the government of Russia can “win” an argument is at gunpoint. We reported last week on the insane ravings of Vladimir Putin, statements so detached from reality that they could only come from the mouth of a neo-Soviet lunatic. But no sooner had we done so than Putin’s man in Ingushetia was spewing paranoia so demented it made Putin look like Gandhi. The indispensible Paul Goble reports that Yunus-Bek Yevkurov believes he had discovered the identity of those who are relentlessly gunning down his cabinet members and police officers. Islamic radicals? Of course not! The culprits are America, Britain and Israel. 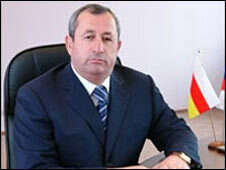 The mayor of the capital of Russia’s North Ossetia region has been assassinated by unknown gunmen. Vitaly Karayev died from gunshot wounds in hospital after he was attacked in Vladikavkaz on Wednesday morning. Police have sealed off the area and say that a murder investigation is now under way. The southern Russian region, like neighbouring Ingushetia and Chechnya, has suffered sporadic violence from militant groups in recent months. Mr Karayev, aged 46, was shot at about 0900 local time (0600 GMT), as he was leaving his home in a car, officials say. He suffered several bullet wounds and later died in Vladikavkaz’s hospital. Some reports in the Russian media say the mayor could have been killed by a sniper. North Ossetian President Taimuraz Mamsurov said he would hold urgent talks with regional security officials to discuss the situation, the Interfax news agency reported. Meanwhile, Russian President Dmitry Medvedev urged investigators to take “all possible measures” to find the perpetrators, a Kremlin spokesman told the Ria Novosti news agency. With every day that passes it becomes more and more clear that the centerpiece of Vladimir Putin’s claim to fame, pacifying Chechnya, is all smoke and mirrors. Just days before, the Ingushetian rebels had forced the Putin regime to withdraw its handpicked puppet ruler of the region, Murat Zyazikov, and “spontaneous dancing broke out in the streets.” Vladimir Putin’s policies in the region have resulted in total failure, not only in terms of managing Ingushetia from within but also in terms of denying the rebels incentives to rise up based on Russia’s foreign policy. 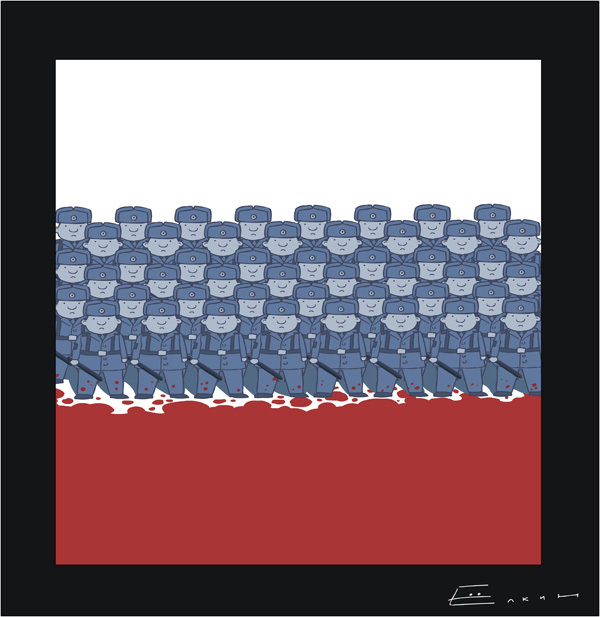 The Kremlin’s demand of freedom for Ossetia and Abkhazia from Georgian rule is viewed in Ingushetia as a blank check to revolution. In a clear indication of this failure, Zyazikov is being replaced with a military dictator. And we report today on a massive suicide bombing attack last week, perhaps Chechen-instigated, in the heart of Russia’s newly annexed province of Ossetia. Though Putin claims to have pacified and rebuilt Chechnya, the Kremlin’s policy of denying foreign journalists the right to travel in the country without chaperones belies this claim. As Radio Free Europe reports: “Nine years and thousands of destroyed lives later, Chechnya remains a bleak and desolate place, its cemeteries filled with fresh graves, evidence of the war still visible amid the Potemkin villages hastily erected by the local strongman, Ramzan Kadyrov, to impress the occasional visitor. ” In fact, not only has Chechnya itself not been resolved, it is now spreading the contagion of revolution throughout the region, most pointedly in Ingushetia. Armed men drove into Russia’s Ingushetia region and abducted up to 15 people including policemen from a checkpoint and a slot machine parlour, police and witnesses said on Friday. Witnesses said the gunmen, dressed in camouflage, entered Ingushetia from neighbouring Chechnya late on Thursday and presented themselves as police officers. Chechen authorities said they had nothing to do with the raid. Islamist groups fighting an insurgency in Ingushetia against Moscow’s rule frequently target gambling halls and shops selling alcohol, saying they contradict Islam. The Kremlin has been struggling for decades to suppress armed rebellions in its north Caucasus region. Chechnya, scene of two wars, has been largely quelled but the violence has now shifted to Ingushetia, where shootouts and ambushes are common. Last Saturday, rebels in Ingushetia attacked a column of heavily armed Russian interior ministry soldiers and killed at least three of them, injuring three times as many. Opposition sources claimed Russian officials were lying about the number of fatalities, and claimed up to 50 soldiers actually having fallen. Then this past Tuesday, rebels in Dagestan attacked a squadron of police officers and killed at least five of them, injuring twice as many. These events show clearly that the Kremlin’s desperation over its manifest policy failure in the region, leading to a massive revival of separatist activity and the KGB regime’s assasination last month of a leading opposition leader in Ingushetia, was fully justified. And they could not be coming at a worse moment.